The CIES Football Observatory in Switzerland is a fancy building full of boffins throwing numbers together and coming with up reports which are then published and end up around the world media. 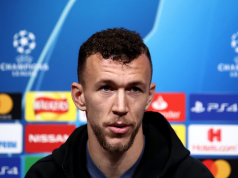 Some of the reports, commissioned by FIFA, UEFA and others, are quite interesting, and some of them plainly odd, but CIES also keep a running valuation of players. For example, Harry Kane is currently valued at €200.1m by CIES, with that a slight drop from the Tottenham player’s height of €204.6m. 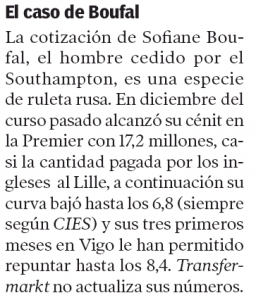 La Voz de Galicia have picked up a recent report and it’s got some interest for Southampton. They go over values of various players at local club Celta Vigo, and say Sofiane Boufal has faced a ‘Russian Roulette’ of valuation over the last year. In December, Boufal hit his peak value at CIES, with the amount standing at €17.2m. That was after getting some reasonable Southampton game time in October and November, scoring a goal and making an assist. But it then fell to €6.8m as things started to go wrong and is now up to €8.4m, after a reasonable start to his loan period in Spain. Southampton obviously want that to get much higher and help a potential sale.